Why are computer screens a problem? The eyes of computer users spend a lot of time focused at the distance of the screen. This can be stressful for the muscles of the eyes which can cause a build up of tension around the eyes leading to sore eyes and even headaches. If it is possible to use Trayner pinhole glasses while working at the computer they will help the eyes focus more easily allowing them to relax more. 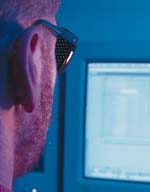 The prolonged close focusing involved with computer use can produce short sight in time. This tendency can be averted by watching TV with Trayner pinhole glasses to relax the eyes.